I'm such a big Game of Thrones fan! I LOOOOVEEEE the series and after reading the first book, I couldn't wait to read the second one. These are slow books, because the writing style is very detailed. I have to give myself a little pep talk before reading these books. Once I'm into these books, I'll rush through! The first book was even more detailed, you get to know the houses, the characters and the world. This second book contains more action. Getting to know characters: I'm a fan of certain characters in the series, but now I'm really getting to know them. Sansa has never been one of my favorite characters in the series, but I loved her in this book. She impressed me by being so strong and brave. I also liked Tyrion even better than the series (he's one of my favorites). He's so smart, in the books you get to know even more of his plots and thoughts. I love the way the book is from different POV's and how you read all the thoughts and feelings. Describing: This book maybe contains 300 pages of describing things, but I need this! It makes me feel like I'm there. The clouds, the trees, the sea, the hills, the castles, the rooms; this adds so much to the whole atmosphere in that certain scene. It's not annoying describing. The endless describing was the reason I DNF-ed Lord of The Rings. In this book it's just enough to get this image in your head. For adults: I read a lot of YA or books for younger readers. It's refreshing to read something for adults. The plotting, conversations and relationships are clearly written for adults and it's nice to read something like that in a while. This is not something I would advise people to read below 18, even though a lot of the characters are much younger than that! If you like Fantasy, adult books and are not scared of a lot of pages, you should pick up this book. I wouldn't call it slow, I would call it describing, which is exactly what this book needs. I did read this book in my native language (Dutch), because I think I wouldn't be able to follow in English. I hope to read the third book before the end of this year. Can't wait for more action, deaths, plotting and romance. "This is one of those rare and effortless reads." "George R.R. 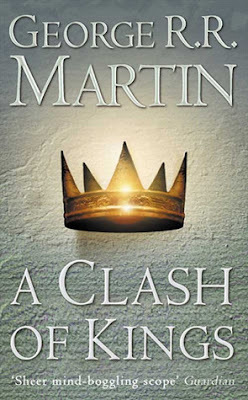 Martin is one of our very best writers, and this is one of his very best books." "Such a splendid tale. I read my eyes out - I couldn't stop till I'd finished and it was dawn." "I will hurt you for this. I don't know how yet, but give me time. A day will come when you think yourself safe and happy, and suddenly your joy will turn to ashes in your mouth, and you'll know the debt is paid." Did you see/read anything from Game of Thrones?